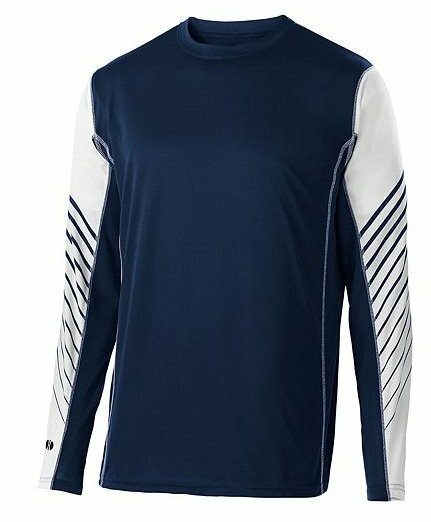 This long sleeve performance shirt features Dry-Excel™ wicking polyester knit offering a high mechanical stretch. Dry-Excel™ polyester wicking grid mesh sleeve, side inserts and back body. Sublimated sleeve print and self fabric neck tape. It is made by Holloway. The suggested retail price for a BLANK shirt is $32.20 for youth and $34.30 for adult. We are offering it at a discounted price for PYB players. $33 for a decorated and personalized shirt. A white sword will be printed on the front and the last name across the top of the back.